2011 is the Year of the Potato. At least, it is for me. The rest of the world celebrated in 2008, when the United Nations declared it the International Year of the Potato. So once again, I am late to the party. Photo taken by Oldest Daughter, and potatoes purchased from Seed Savers Exchange. I ordered the smallest quantity available from Seed Savers Exchange: 2.5 pounds. But I was stunned to see how many potatoes can squeeze onto a scale registering 2.5 pounds. It sounded like only a few potatoes, just right for a beginner like me. 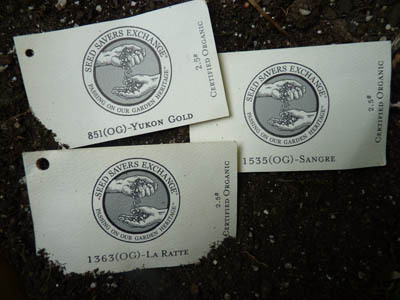 But when I saw the 12 potatoes in both the Yukon Gold and the Sangre sacks, and the 30 potatoes in the LaRatte sack, and realized that each potato would be cut into halves or quarters, I realized what I had: a LOT of potatoes to plant. I had many more potatoes than available space. So I traded some of those potatoes to my good neighbor in return for two bales of clean yellow straw for my garden paths, and felt well served. 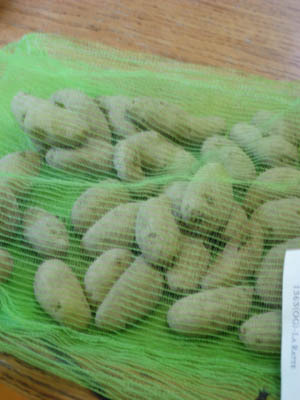 Lovely LaRatte, in the bag -- aptly named, as they do look like baby rodents. The instructions told me to first set out the potatoes daily for up to two weeks, on days that ranged from 60-70 degrees. This allows the potatoes to sprout. Then, I was to cut the potatoes into pieces (see the “Photo of the Day”) and allow the cut side to callous for 1-2 days prior to planting. (The callous prevents the potato from rotting in the soil.) 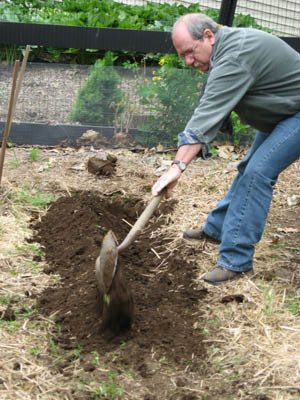 Then, plant the potatoes in a trench 8″ deep, with the cut-side down. 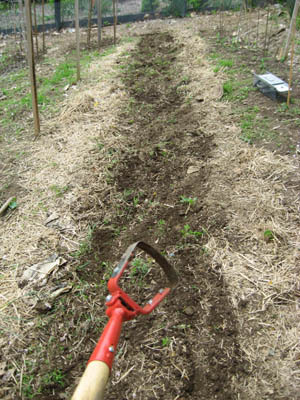 Stirrup hoe, to remove the weeds from the bed. 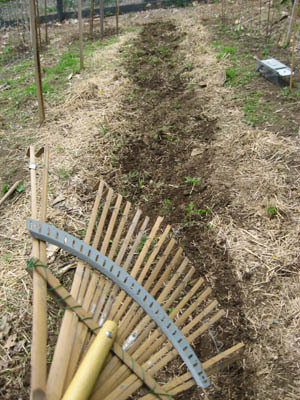 Leaf rake to clear off the discouraged weeds. 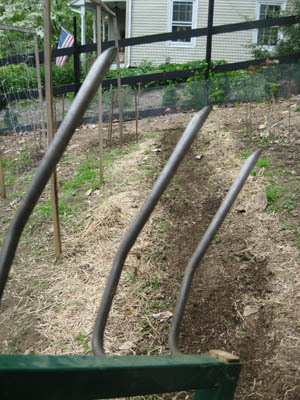 Broadfork to aerate the soil. Little holes = only evidence of aeration, besides your taking my word for it. And then the Dig began. Husband helped, although that meant I had to consider his advice — which was to dig one trench down the center of the bed. 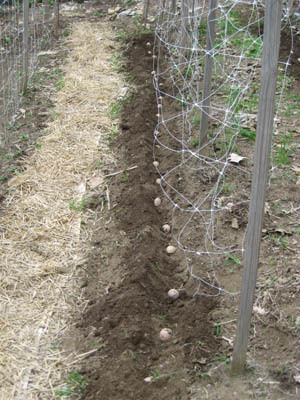 I’d wanted to dig two trenches in the bed, planting twice as many potatoes, resulting in delicate small potatoes. He wanted manly potatoes, and he won. One trench it was. 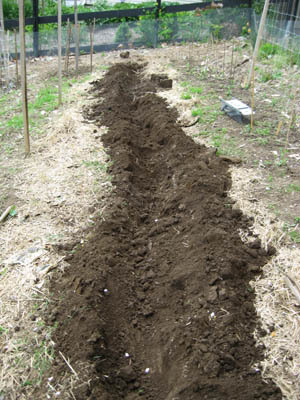 Not the most even of trenches, but I suspect the Yukon Gold and Sangre potatoes did not mind. Look at that dark beautiful dirt! These Sangre potatoes were a bit smaller, and so I planted them whole. I still ended up with about 12 potatoes. I decided to place them next to my compost bin, and cover them with straw, repeating my partially-successful experiment of last year: the no-dig method of planting potatoes. They're under the straw. Trust me. This method, for those without digging varmints nearby, is the ultimate in ease. Lay the potatoes on the ground, and cover them with 4″ of straw. 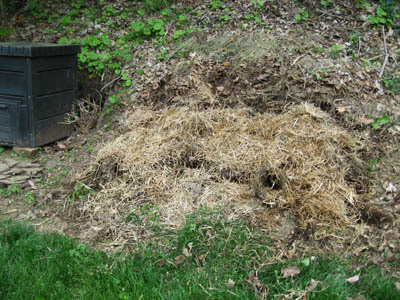 When the plants emerge and leaf out, add additional straw to completely block the sun from reaching down to the growing tubers. You harvest your potatoes without having to dig, and eat them without having to wash off too much dirt. I will report which method is most successful: those from the 8″ trench in the dark dirt, and those grown on the soil near the ever-cooking compost bin. — While potatoes may be synonymous with the Irish these days, they were grown in the Andes mountains centuries before Europeans ever set foot in the new world. The Inca people of Peru were growing them as far back as 200 BC. They were first introduced to Britain and Ireland in the late 1500s. They weren’t an immediate hit either, many people blamed them for diseases and railed against them because they weren’t mentioned in the Bible. — Potatoes require less water to grow than other staple foods such as wheat, rice and corn. — The average American eats approximately 126 pounds of potatoes each year. — The potato is the fourth most important crop in the world after wheat, rice and corn. Great blog. When my grandson was younger we planted potatoes together. Because I didn’t have much space, I used a method you might try. We dug a deep hole put 4 or 5 potatoes in the botton, threw in 4 inches of dirt. We repeated this three more times so we had a layer 4 deep. He would check the potatoes every time he visited. In the fall when we dug up pounds of potatoes, he was in awe. He is grown now but he was about 8 then. This is so interesting! I’ve heard of this method using a trashcan, but not with digging a very deep hole in the ground. Amazing! Something I’d like to try myself. Thanks for commenting! I found you on the LinkedIn writer’s group. I love the pictures you post here, in succession with your journey. Gardening is intriguing – so much potential on the literary and symbolic fronts, not to mention chock full of stories of trial and tribulation. You want to make things grow. How cool is that? My grandparents owned a nursery in a small Wyoming town for many years before they passed away. I have essays about working there, the way Grandma gloried in the challenge of making things grow when no one else could. I would love to follow your blog, if you’ll follow mine on motherhood and raising a little boy: http://www.sugarbeanscribbles.blogspot.com. Thanks for sharing! Good deal! I’ll check out your blog right away. What types of things did your grandparents grow? And thank you for the kind comments about the blog. 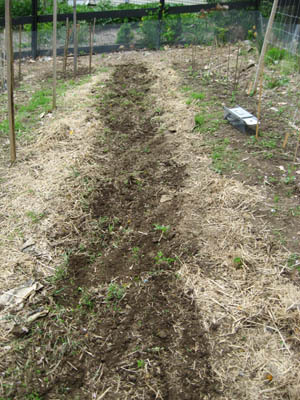 I plan to do a new post this weekend — after I take some photos of the potato plants that have started to emerge! Thanks for commenting, and thank you for sharing the link to your blog! I look forward to reading it.